After its arrival in the entertainment industry few months ago, Watch & Dine Cinema in Kumasi has gotten a partnership deal with Zylofon Arts Fund. The two parties had a partnership agreement on Friday, August 3, 2018 to support film producers to have a platform to premiere their movies and make good income. A mutual agreement has been reached between the two entities to build a cinema network across the regional capitals. Watch & Dine Cinema, located at the Kumasi City Mall is a world-class cinema. It has four executive state-of-the-art movie theatres, all fitted with deluxe furnishing and superior acoustics and image projection. The Watch & Dine Cinema concept features a delightful fusion of the comfort and coziness of a plush movie theatre, with the pleasure of nourishment derived from a top-notch restaurant or eatery. Zylofon Arts Fund, a subsidiary of Zylofon Group and an NGO, has for the past four months invested heavily into the film industry to experience the advent of a booming Ghanaian film industry. They are also aimed at revamping the Creative Arts Industry by creating jobs, providing the enabling environment and build the required structures to let our Film Producers produce quality movies to market, distribute and sell to generate decent revenues to bring the industry back on track. 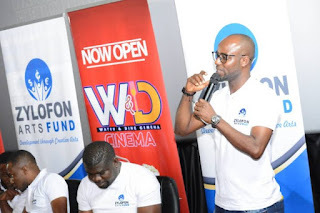 Watch & Dine Cinema is headed by Mr. Kwabena Obeng (an entrepreneur, Chairman & CEO of Watch-and-Dine Cinema) and Mr. Osei Agyemang-Duah (Managing Director). Mr. Kwabena Obeng is a Ghanaian entrepreneur and philanthropist who has the Creative Arts Industry at heart. He has so far invested heavily in the Ghanaian Cinema and music space.